Magic Leap is a secretive Florida-based startup that makes augmented-reality headsets. On Wednesday morning, it launched its first device: Magic Leap One. It’s a product that’s over six years and $2.3 billion in the making. The first media impressions were published on Wednesday morning, and they all point to the same problem shared by Microsoft’s HoloLens headset: a tiny field of view. The next step after smartphones is almost certainly some form of augmented reality — at least, that’s what investors believe, to the point where they’ve pumped over $2.3 billion into Magic Leap, a Florida-based startup that creates AR headsets. For years, Magic Leap has raised astronomical rounds of funding from the likes of Google, Alibaba, Fidelity, and JPMorgan. And on Wednesday morning, after years of hype and fundraising, Magic Leap released its first product: the Magic Leap One Creator Edition. It includes a headset, a controller, and a corresponding computer (the circular thing on the left in the picture above). The idea is simple: It’s a wearable computer. Looking through Magic Leap One’s “Lightwear” glasses, you can manage your email, watch YouTube videos, or do whatever other stuff you’d do on a smartphone or computer. Instead of on a screen, it’s projected into the world around you. You know the movie “Minority Report”? It’s kind of old at this point, but if you’ve seen it, you may remember Tom Cruise using a computer essentially projected into the world in front of him. Magic Leap’s headset is similar, and it goes where you go. But there’s a huge difference between what Magic Leap is promising and what it’s offering. Simply put, Magic Leap’s headset offers a viewing window into an “augmented” reality, rather than fully engulfing users in that reality. Imagine a window-sized rectangle in the middle of your view, through which you can see various things — your emails floating in mid-air, or an NBA game running on a floating screen, or whatever other stuff you’d normally do on a smartphone or a computer. That’s what it’s like using Magic Leap One. It’s like looking through a window into a digital world, but the edges of it disappear the moment you turn your head. It turns out, that feels about as natural as it sounds. “Not being able to see a fuller view of the room’s virtual objects is a serious drawback,” Stein said. “Sometimes I lose track of things I can’t see, and require sound to help me track where the augmented things are hiding, and where to turn.” Stein wasn’t alone in his criticism — every one of the handful of previews Magic Leap One issued the same concern. It’s the same problem that Microsoft’s similarly futuristic AR headset, HoloLens, suffers from; using HoloLens feels like looking through a window into a different world rather than moving into one. Seeing only what’s directly in the middle of your vision while wearing a headset is one of HoloLens’ biggest limitation, and it ends up feeling like a tease of something amazing. When I last wore the HoloLens, it told me where to walk by painting arrows on the floor in front of my eyes. The proof of concept there is obvious — imagine wearing a simple pair of glasses that offered Google Maps within your vision. Amazing! But so are the limitations. 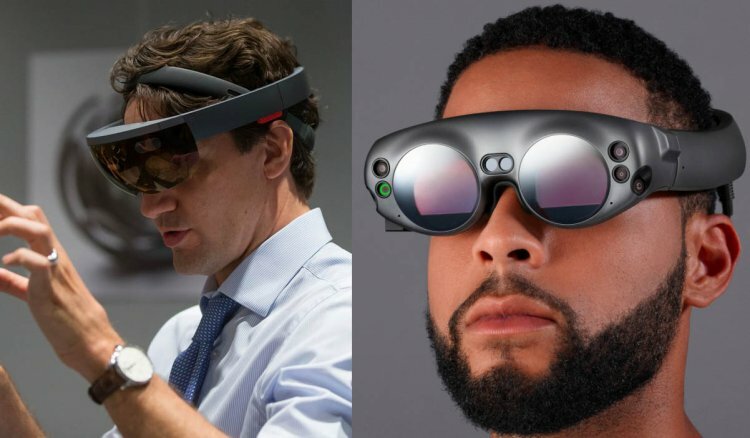 Magic Leap One and HoloLens can’t project anything into your peripheral vision, nor can they get anywhere near close to filling the field of vision of an average person. This is tremendously meaningful in ways that are inherently human, like seeing something moving out of the corner of your eye and being able to shift attention accordingly. It’s only after you limit your field of vision that it feels so integral to sight, but it really is — try walking around for a few minutes with your hands held up to your eyes, binoculars-style, and see how it goes. This is one of the largest limitations of all augmented/mixed reality at the moment, and Magic Leap One is no different. Subsequent models of Magic Leap’s hardware are expected to expand the field of view, but in reality it’s clear that it needs to fill your field of view — or at least come close enough to not feel like you’re looking through a window. When that future comes, augmented-reality products will come much closer to delivering what they promise. But, for now, they’re just very impressive computer glasses.